A "Tasks" calendar appears in my list of "My Calendars" in Google Calendar. It's only a minor irritation, but I have a small screen, I don't want it and never plan to use the Task list. Can I stop it appearing or remove it? When I look at the Settings page for my Google Calendar account, it appears that it cannot be deleted. The CSS selects the div containing the content for the Tasks entry and sets it to not display. It also sets the divs which allocate space for calendar entries to use max-height rather than height to determine their size, which in turn allows these divs to collapse if they contain no rendered content (such as in the case of the Tasks calendar entry). This CSS will not get rid of the 1 pixel white border at the bottom of the Tasks entry. If the background of your calendar listing is white, this will be unnoticeable, but if the background of that section is a color other than white, you will have a double thickness border where the Tasks entry used to be. 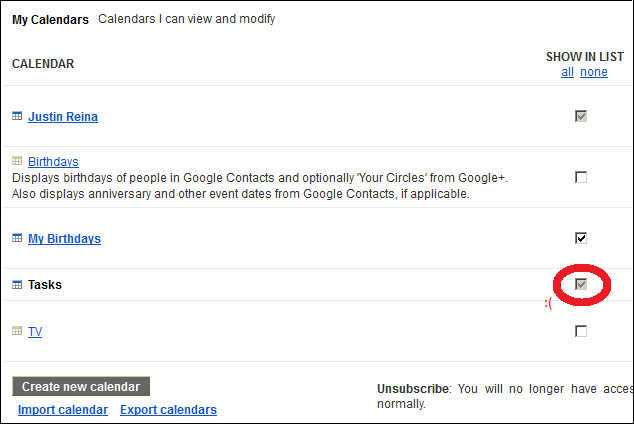 Unfortunately, like the "Birthdays" calendar, you can't unsubscribe or otherwise remove the "Tasks" calendar. The best you can hope to achieve is to not have any entries appear in your calendar (by de-selecting it). Figured this one out - hit the Cog when viewing your calendar and switch your view (temporarily) from "Compact" to "Cozy". An arrow will appear on the divider between your calendar and task list. Click that! Then you can switch back to "Compact". You cannot remove Tasks, it has the same active-status as your primary calendar. You can see this under Settings(Cog Wheel)->Calendar(Tab)->'SHOW IN LIST', it is greyed out for Tasks just like for your Primary Calendar :(. Not really a fix, but if you hit the dropdown arrow on the left of MY CALENDARS they all disappear. At least you don't have to see it. This works the same for OTHER CALENDARS btw. Not the answer you're looking for? Browse other questions tagged google-calendar google-tasks or ask your own question. How do I get “Tasks” in my list of calendars?